Salfit - On Sunday 2nd June the occupation forces notified villagers from Bruqin in Salfit that they must evacuate more than 100 dunams of land. The mayor of Bruqin, Nafid Barakat and resident Salah Amer are the owners of the land and Mr Barakat had just replanted the land 4 months before receiving the evacuation notice. A group of settlers have also attacked citizens in their cars in the village of Yasuf, Salfit and closed the main street of the village. Jerusalem - In Jerusalem, the Israeli occupation forces handed over demolition orders for houses in Silwan, south of Al-Aqsa Mosque, owned by the Awda and al Rajabi families. Nablus - On Sunday, the Israeli occupation forces issued a military order to seize 60 dunams of land in the villages of Awarta and Rujeib, Nablus district. This land is near the settlement of Itamar which was also built on the lands of nearby Palestinian villages. 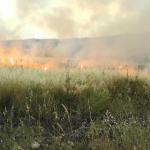 On Monday 3rd June a group of settlers set fire to about 10 dunams of agricultural land in the village of Madama, south of Nablus. Occupation forces also launched an inspection of Yamoun and Kafr Dan, villages in the Jenin district, under the pretext of searching for water wells. Forces had earlier closed a number of wells used by citizens in these two villages to irrigate their land. Bethlehem - A group of settlers from the Betar Illit settlement burned 20 olive trees in Husan, Bethlehem which were owned by Abdel Salam Atta. The Israeli occupation forces have also notified 4 citizens (including Nadi Faraj and Ahmad Badawi) to halt construction in the Wad Rahal area of Bethlehem, according to the Palestinian news agency Wafa. Jericho - On Tuesday 4th Israeli occupation forces demolished four houses and four Bedouin small holdings belonging to descendants of the Zayed tribe in al-Nuweima, north Jericho.